A VERY SMALL COMPACT CAR??? ASTON VS TOYOTA…WHICH ONE??? Work on the concept is ongoing and will continue into 2010 when it is hoped that it will become a production reality initially available to Aston Martin customers in the UK and Europe. Relax, it’s just a concept…for now. Aston Martin actually hopes to make this a production model next year or soon thereafter. I can’t help but wonder whether Aston’s new owners are getting nervous about their bottom line, hoping to get into the mass motoring market as a way to make mass profits. But Aston Martin is an exclusive prestige marque, which is at least part of the reason their customers buy Aston Martin cars. The Toyota iQ is a city car introduced at the 2008 Geneva Auto Show, with Japanese sales beginning in October 2008 and UK sales in January 2009. The production iQ followed a concept vehicle presented at the 2007 Frankfurt Auto Show. An American version of the iQ is slated for release late 2010 or early 2011 branded as the Scion iQ. The name iQ, an initialism of the term intelligence quotient, recalls a competitor, the Smart Fortwo. According to Toyota, the i stands for “individuality” “innovation” and “intelligence”, while the Q stands for “quality” and points to the iQ’s “cubic” shape. It was Japanese Car of the Year for 2008. 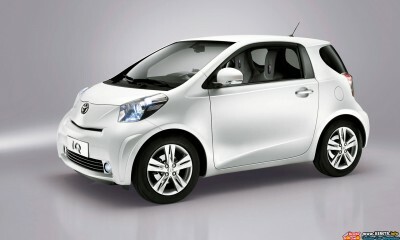 The iQ was initially designed at the Toyota European Design and Development (Toyota ED2) studio in Nice, France.